Weekly Update – Book Shows! I had a book signing today at an author showcase – the first in a long line of weekends full of selling books, signing books, and talking about books! 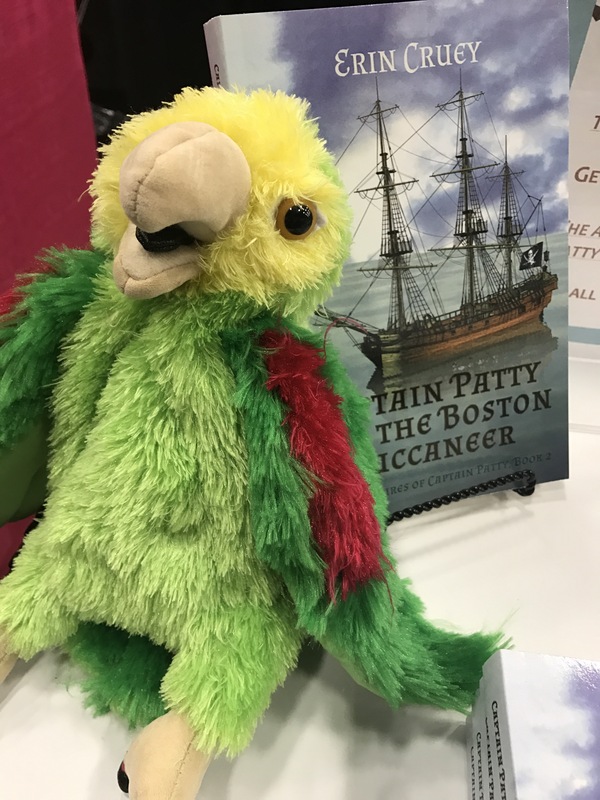 As you can see from the picture above, Ralph the parrot made a special appearance (thankfully not annoying customers like he does for Captain Patty), and the day was a lot of fun! But what are book shows and what can you expect from them? When I was a newer author, I wasn’t quite sure what to do or how to start. Not all shows/signings are the same, and it’s important to learn about them to make the experience less stressful. You’ll learn quickly that some shows will not help you earn money or exposure. It may be weather, poor turnout, uninterested customers, or just plain bad luck. Don’t fret – just because a show has poor turnout or sales one year doesn’t mean it will always be that way. …But they aren’t all a flop, either. Some shows may surprise you. Even if turnout is low, you may find yourself getting a profit. Do your best, pray for good weather, and stay positive. Good shows do happen, and when they do, there’s no greater feeling. It’s a great time to connect. I spent a good half hour talking with two readers who happen to be inspiring writers, and it was a blast! Book shows are a great way to learn what your readers are looking for and what they’re wanting to read. You also get a chance to share your experiences about writing and what makes your book(s) great! You learn how to market your book(s). Being at book shows and connecting with others allows you great practice in perfecting your sales pitch. You’ll learn quickly what hooks potential readers and be able to use that for future shows. You can learn about how other books are doing in your field. Let’s be honest – we authors are curious about how our peers are doing. How are sales? What genres seem to do well? Is the market changing? What are good strategies for marketing? What are good shows to attend? You can learn a lot through observation and speaking with your peers! You gain increased exposure, even if a profit isn’t made right away. Even though some shows have flopped, those same failed-signings occasionally brought me good things, such as connections with magazines and newspapers, invitations to other shows, and opportunities to speak at book clubs and schools. You never know who you’ll meet at a book show! You might improve your eBook sales. Not everyone wants to spend the extra dollars in buying a paperback, so it’s important to have business cards at the ready for e-readers to take and remember you. Though I haven’t seen a dramatic increase in my Kindle sales (yet) from shows, I’ve gained a handful of readers through people taking my card and buying the e-book version later. This entry was posted on September 10, 2017 and tagged author show, book show, books, Writing. Bookmark the permalink. ← Weekly Update – The Book Cover is Here!